The German rider André Greipel (Lotto Soudal) won Stage 7 of the 99th Giro d’Italia, Sulmona – Foligno, of 211km, in a bunch sprint. Giacomo Nizzolo (Trek – Segafredo) and Sacha Modolo (Lampre – Merida) finished second and third. Marcel Kittel (Etixx – Quick-Step) wasn’t involved in the bunch sprint, due to a puncture in the final kilometres. 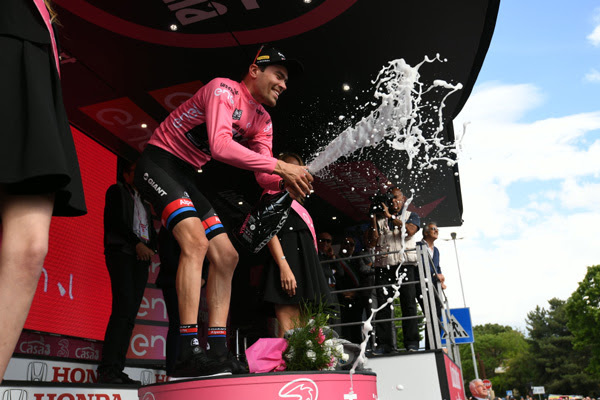 Tom Dumoulin (Team Giant – Alpecin) remains the race leader and keeps the Maglia Rosa. 3 – Sacha Modolo (Lampre – Merida) s.t. Seconds after the stage finish, stage winner André Greipel said: “It was tough all day with a strong breakaway that was hard to catch. My team did an amazing job. The chase had to be a serious one. Before the sprint, we hit the front early. I was happy to find my way to another win. The finish was nervous. If we were playing football we’d say we’ve scored a hat trick with three consecutive stage wins. We’re very happy”. Race leader Tom Dumoulin said: “We were hoping for the breakaway to go from the gun but Nippo – Vini Fantini wasn’t happy with what happened because of the King of the Mountains competition. They chased on the climb and they made the race hard. A small group formed and eventually a breakaway went. It came back together, but what a hard day!”.